Explanation: Now sweeping high above the ecliptic plane, Comet Lemmon has faded dramatically in planet Earth's night sky as it heads for the outer solar system. Some 16 light-minutes (2 AU) from the Sun, it still sports a greenish coma though, posing on the right in this 4 degree wide telescopic view from last Saturday with deep sky star clusters and nebulae in Cassiopeia. In fact, the rich background skyscape is typical within the boundaries of the boastful northern constellation that lie along the crowded starfields of the Milky Way. 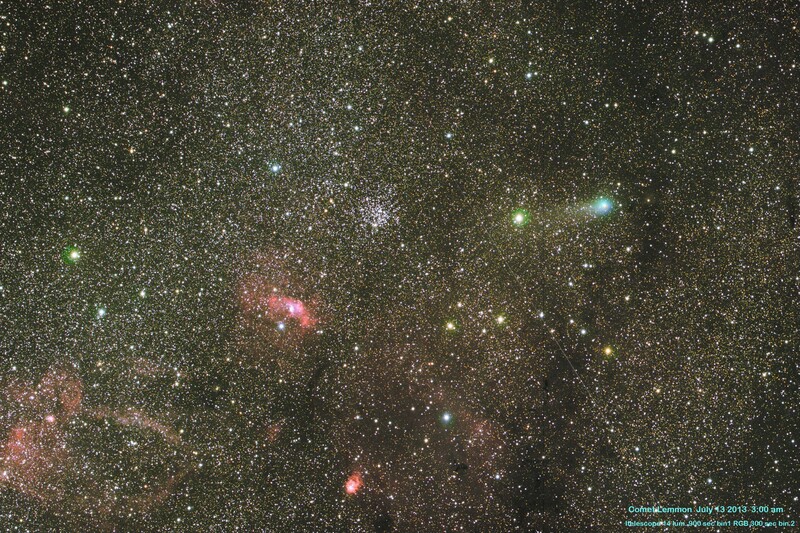 Included near center is open star cluster M52 about 5,000 light-years away. Around 11,000 light-years distant, the red glowing nebula NGC 7635 below and left of M52 is well-known for its appearance in close-up images as the Bubble Nebula. But the fading Comet Lemmon is not the only foreground object on the scene. A faint streak on the right is an orbiting satellite caught crossing through the field during the long exposure, glinting in the sunlight and winking out as it passes into Earth's shadow. Interplanetary News: Photo Op from Cassini and MESSENGER - just be sure to smile and wave.